There are rich people. There are very rich people. And then there are the wealthiest billionaires in the world. Those wealthiest billionaires operate in a different orbit than the rest of us. They have the kind of money that most of us can’t even properly understand. Bill Gates, the co-founder of Microsoft, tops the list with a net worth of $87.4 billion, according a recently released report from Wealth-X, a Singapore-based company that compiles market research on the wealthiest individuals in the world. Amancio Ortega Gaona, the Spanish founder of trendy fast-fashion house Zara, ranks second on the list with $66.8 billion. Amazon founder Jeff Bezos is fourth on the list with $56.6 billion, and Facebook founder Mark Zuckerberg is eighth on the list with $42.8 billion. The wealthiest people in the world come from all across the globe and a wide variety of industries, but one common thread is that many of the people on the list are entrepreneurs. Of course, there is no guarantee of financial success when launching a business. But it’s definitely one path to the top. 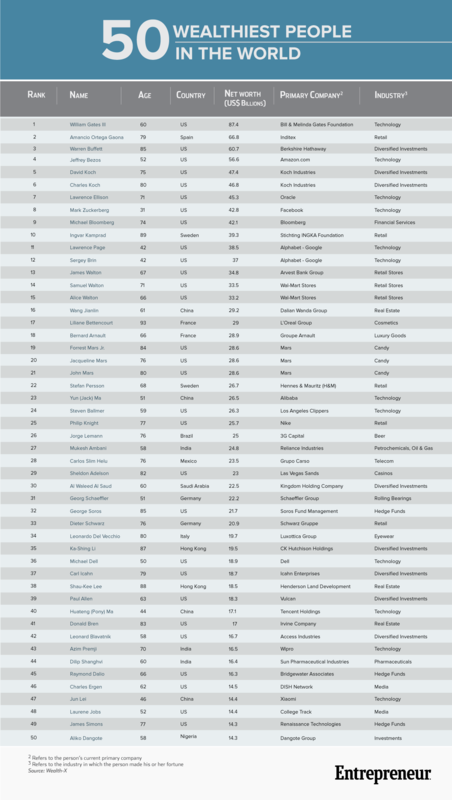 For a bit of mid-winter inspiration, have a look at this newly released list of the 50 wealthiest people in the world. And then, get over your winter doldrums and get your hustle on.